Citymapper has long been a top option for navigating in major urban centers thanks to its app, but now it’s getting even closer to the heart of the problem – by operating its own buses, starting with its first commercial bus route in London. The inaugural route is a nighttime one, running between 9 PM and 5 AM on weekend nights in East London, which Citymapper identified as underserved by current public transit options using its app and data analysis tool. Citymapper’s buses are proper buses – the company joked that for Silicon Valley, it’s fine to refer to them as “social hyper local multi-passenger pooled vehicles.” But they’re immediately recognizable as large city buses, clad in Citymapper’s brand-specific green. Inside, they’re quite different, however, with a host of tech designed to make the bus experience better, for service operators, drivers and passengers alike. 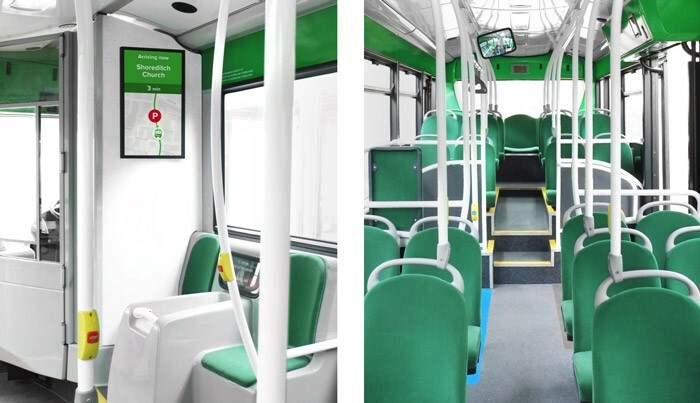 Part of running the route will include managing buses via onboard tablets, which can run a variety of apps that Citymapper will update and optimize as they go. One of the problems they’re trying to solve for is ‘bus bunching,’ or that thing that happens where you get four buses in a row, the last three of which are virtually empty, and then none for another 20 minutes. Smart displays throughout the interior will also show passengers what’s going on in terms of progress along the route, next stop information, how long it’ll take to get to future destinations and the status of connecting transit services, including notifications of delays. Citymapper also hopes to provide real-time info about the number of passengers onboard to potential users via its app, letting riders know if and when seats are available. Payment is handled via contactless tap, which is available on most UK debit or credit cards, as well as via Apple Pay and Android Pay. Citymapper is evaluating offering in-app payments via its app, too, but is betting on contactless as the more logical option. And as a bonus convenience for riders, seats will have USB ports integrated for easy charging, which is a great thing to have available especially after a night out. This new CM2 line, as it’s called, will be fully integrated with Citymapper’s app and routing data, and it’ll show live information from the buses, along with arrival times for stops. It’s going to share the data openly with other transit apps and websites, which is only fair given that’s what it asks from cities and public transit authorities. This is a broad experiment that could have a lot of potential implications for Citymapper’s business – you can see how it’s playing with a number of different opportunities here, including as a platform operator to help inform deployment and route management for city transit authorities. Overall, it sounds like a very cool project – I’ll be interested to see how they handle vomit, however, to be quite honest, given that this is basically the post-party bus for London revellers.